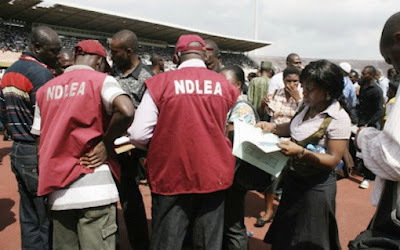 The National Drug Law Enforcement Agency (NDLEA) Monday arraigned an Inspector of Police, Bola Adigun, before a Federal High Court, Lagos, Southwest Nigeria Limited on charges bordering on conspiracy, drug dealings and wilful obstruction of security agents from carrying out their official duty. The anti-narcotic agency in charge number: FHC/L/192c/17 alleged that the Police Inspector currently attached to the Economic and Financial Crimes Commission (EFCC), and one Voke David, now at large, of Jakande Estate, Amuwo Odofin, Mile 2, Lagos, had on May 25, 2017, about 1a.m., along Badagry-Lagos Expressway, at Agemowo junction, conspired to transport 49 large bags containing compressed vegetable substance suspected to be Cannabis Sativa, popularly called Marijuana, weighing 2.338 kilograms, in a Volkswagen LT bus marked FKJ 937 XS. The Police Inspector was also alleged to have unlawfully possessed the said banned weeds. NDLEA alleged further that the accused, while armed with a Jericho Pistol numbered BDA 380425pm 56369, calibre 9.85 CAT 1661 loaded with 10 rounds of ammunition, wilfully obstructed the official of NDLEA from exercising the powers conferred on them by the NDLEA Act. The offences alleged to have been committed by the Police Inspector are contrary to and punishable under sections 14(c), 19 and 49(B) of National Drug Law Enforcement Agency Act Cap N30, Laws of the Federation of Nigeria, 2004. The accused however, pleaded not guilty to all the three counts of the charge. The presiding judge, Justice Cecilia Mojisola Olatoregun, admitted him to bail in the sum of N10 million with three sureties. Justice Olatoregun also ordered that each of the sureties must be a landed property owner, with evidence of three years tax payment, and have their addresses and means of livelihood verified. The judge ordered that the accused be remanded in prison’s custody pending the perfection of his bail conditions, while adjourning the matter till June 27, for commencement of trial. » Inspector General of Police MD Abubakar goes on terminal leave.